Jio is an affordable LTE carrier, but last year it decided to launch its own featurephone. And it has been a rousing success, based on Counterpoint data the JioPhone went from zero to 26% in less than a year. It knocked Samsung off its top position, the company went from 25% to 15%. This is just for the final quarter of 2017, the Korean company is still on top for the full year. The JioPhone started shipping only in Q4 and took a respectable 11% share for the full 2017. Note that this is based on shipment numbers, which isn’t Samsung’s favorite metric. Nokia/HMD is another newcomer, though its growth has been quite modest – the reborn brand commands just 6% of the market in the final quarter. For the full year, Nokias drop into the Others category. 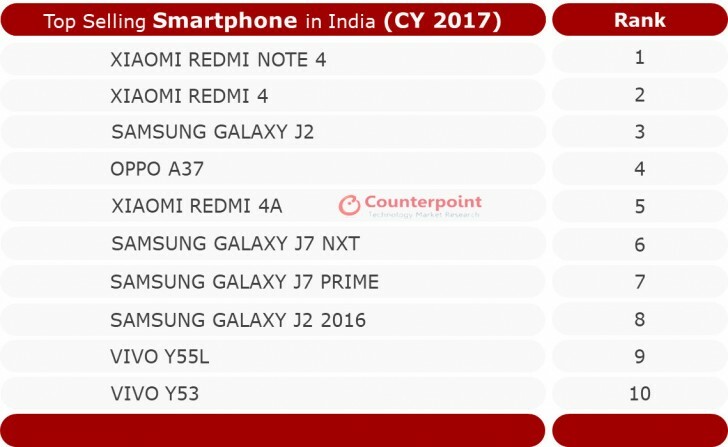 As for feature phones, the Xiaomi Redmi Note 4 claimed the top spot, followed by the smaller Redmi 4. Xiaomi was the fastest growing smartphone brand in the country and it drove the fastest growing segment – the mid range. Dear Editor In 4th paragraph, you have mentioned Xiaomi Redmi note 4 as feature phone. Kindly correct this thing. Thanks.